Most artists don’t record in canyons. But Andrew Bird did, and it can be heard being played through over 30 colorful, Dr. Seuss-like speakers at the Institute of Contemporary Art. The exhibition, Sonic Arboretum, on which he collaborated with sculptor and instrument-maker Ian Schneller, opened Wednesday. Bird, a primarily indie-folk musician, recorded himself playing the violin, along with the occasional whistling and sound of flowing water in the Coyote Gulch canyons of Utah. Deviating from Bird’s usual singer-songwriter material, the recording is a 50-minute-long nonstop experience. If you had to slap a genre label or two on “Echolocations: Canyon,” as it’s called, you would have to call it avant-garde. It’s melodious, but the bouncing, reverberate echo effect of the exhibition makes it just as much about stylized ambiance as it is about composition. But one genre doesn’t quite do it justice. The piece often breaks into segments that feel more like the score to a Hayao Miyazaki film than anything else. (I’d like to quickly take a step back from this piece to formally request a Miyazaki-Bird collaboration.) The oscillation between the feels of scientific exploration of echoes and the visceral, driving nature of the arrangement gives the piece a depth worth talking about. Schneller’s role in the exhibition is not to be shoved aside, however. He was the one to meticulously place each of the 30-plus speakers made from recycled newsprint, dryer lint, baking soda and more on all four sides of the museum room. The smaller details too, make what he accomplished technically impressive. To get all of the speakers to play the track at the same exact time, a multitude of iPod nanos have to be synchronized at a level of precision that is beyond human capability. 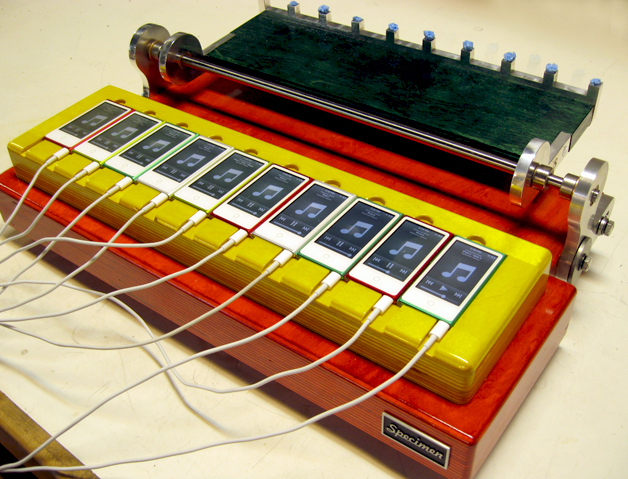 To work around this, Schneller took the route that only a sculptor-instrument-maker would take: he created a device that hits play on up to ten iPods at a time, at the exact same moment. It’s called the Nano Sync, and it wouldn’t be art if it wasn’t as colorful and visually stunning as the rest of the audio equipment in the room, would it? All together, the sonic and visual components come together to form a surreal experience. Whatever you’re thinking about when you walk into the exhibition, your mind will probably entirely lose sight of it in the process of calibration. How much you get out of Sonic Arboretum also depends on how much time and attention you give it. Because there’s more art outside both entrances to the room, it’s easy to walk in, listen for a minute or two, and then continue on with your museum tour. There’s nothing necessarily wrong with that approach. You have enough time to appreciate the visual aesthetic of Schneller’s artful speakers and get a general sense of Bird’s music, even if it’s on a relatively superficial level of understanding. But if you want to stop, sit down on the bench in the center of the room and close your eyes, you can do that too. (And you won’t be alone, chances are). You can try to picture yourself sitting down cross-legged in a solitary canyon in Utah while a renowned musician plays his violin not too far away, if you’d like. Or you can let your mind wander and let Bird’s music be a backdrop to your thoughts. As is the nature of modern art, there is no one expected outcome, as cliché as it sounds. There’s no specific way you’re supposed to think or feel when you walk out. It’s considerably liberating in a sense. You can guess where he will record each one, but not where each one will take you when you hear it. 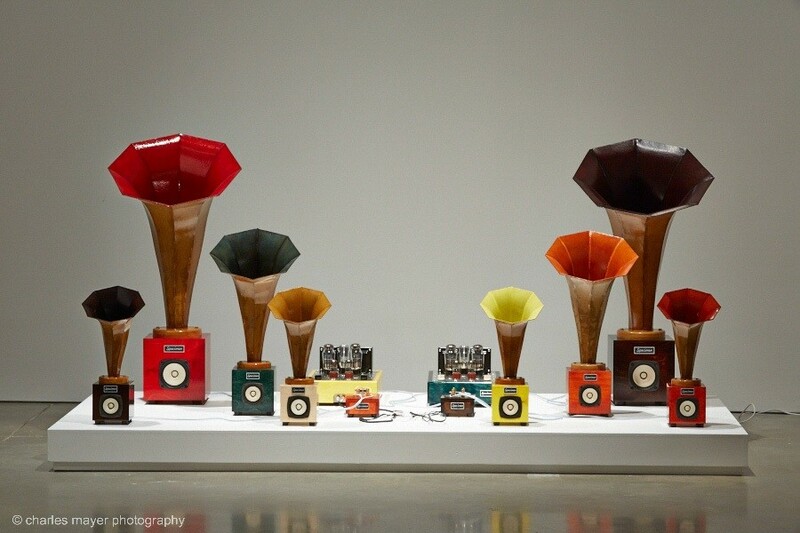 Sonic Arboretum is on display at the Institute of Contemporary Art through May 10.